Yesterday, at the International Conference on High Energy Physics in Melbourne we heard three presentations from ATLAS, CMS and the Tevatron experiments, (D0 and CDF) on the Higgs boson searches. It was great to see how all these results are consistent with each other: between the four experiments, the two accelerators operating at different energies and the six independent decay channels. All give the same picture: we have really found a new boson. Everybody’s attention is now turned towards establishing the exact identity of this boson. Is it the one predicted by the Standard Model or one of the five Higgs bosons associated with supersymmetry, another theory that attempts to fix the few remaining problems of the Standard Model. Although the theory was unable to predict the exact mass of the Higgs boson, it provided strong constraints on where it could be found. Many quantities are interconnected by the equations of the Standard Model. This is why we keep improving the uncertainty margin on these quantities. Putting all this information together allows us to check the consistency of the model. This has been the highlight of many conferences for a decade or two. Each new update showed how much progress had been accomplished when all the measurements were combined in a complex algorithm designed to test the so-called “electroweak” part of the Standard Model all in one go. This is very similar to checking the stability of a very elaborate mobile after modifying each of its components slightly. Yesterday, for the first time, we saw what the newly measured mass of what is most-likely a Higgs boson adds to this global picture. The vertical axis shows the measured mass of the W boson and the horizontal axis, the mass of the heaviest quark, the top quark. The blue ellipse is centered on the measured values of these two masses. The ellipse gives the error margin. There is a narrow blue band below the large green band. This represents the actual measured mass of the Higgs boson announced on July 4th, the width being its uncertainty. So as it stands, given the overlap, there is agreement, at least within errors. 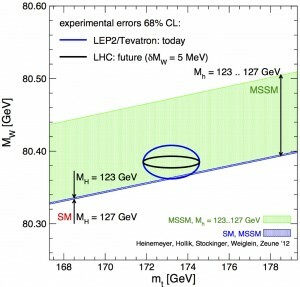 The black ellipse is a projection of what this picture will look like once the LHC experiments reduce the uncertainty on the W mass from the current 15 MeV to only 5 MeV. If all is consistent within the Standard Model, the black ellipse will have to overlap with the narrow blue band indicating the Higgs boson mass. If the central value of the W mass does not change, then there will be some inconsistency with the Standard Model (the very narrow blue strip). On the other hand, if supersymmetry or SUSY is the real, more global theory of nature, the green area gives the mass values allowed for the W and top quark. MSSM stands for Minimal Supersymmetric Model and is just one specific model within the vast SUSY space. The bets are still open on what will come next. Is this Higgs boson the one predicted by the Standard Model, supersymmetry or some other version? Patience is in order but the answer will eventually come.